Put a map of Lakewood on the wall. Throw a dart at it. Another. A third. Draw the lines between them to forma triangle. Walk from one point of the triangle to another and follow the hypotenuse home. Take a notebook,camera, recorder. Note what you see,hear, touch. Run-down buildings,new construction. Businesses, houses,people. Litter, garbage, graffiti. Advertisements, posters, signs. Coincidences,the accidental, the unusual. Signs. They're all signs. "Walking makes for content," Robert MacFarlane writes. "Footage for footage." Take an object you know well, say a Wild Child tee shirt or a family heir-loom, a house or neighborhood, and examine it as if for the first time, as if you know nothing at all about it. Give it attention beyond attention, as Louis Agassiz instructed his Harvard seniors to do with a frog for a senior comprehensive exam. Tell me about the frog,he asked. They were put out. They knew their biology. They knew a frog when they saw one. Agassiz persisted. Tell me about the frog, he repeated. The next day they told him about the frog. It's a beginning, he said. Tell me more. By the third day, the frog had become limp and stank, but the students had got to know the frog better than they thought possible, perhaps even more than they knew themselves. Make your night day. 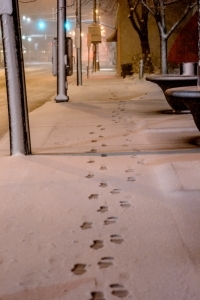 Go up and down the streets of Lakewood from dark until dawn. Stop at any place that is open. Talk to those you meet. The landscape of Lakewood escapes recognition. Deserted streets after dark, as Atget's photographs of Paris at the beginning of the 20th century demonstrate, are surrealist moonscapes, if not sites of crime. Whether you know it or not, you have a become one with the night, and darkness becomes less your enemy than it is your friend, as it for the poor and homeless, the illicit, Melville's isolatos. You greet the dawn with a sobriety you had not thought possible. Cross lines, open doors, enter buildings. Society establishes lim-its, boundaries, borders, fences which determine where we can be. We know what these are, but may not know why. We may assume a closed border at a border crossing. When is it possible to walk into a neighbor's house without knocking? The answer tells us about neighborhood. In barrios in Puerto Rico, the house is the neighborhood,and no one shuts anyone else out from entering any residence. In the '60s on the island, the only television in a bar-rio was in the plaza. Each night, the family watching television is the neighborhood. "Beneath the paving stones the beach," was a radical slogan to rally workers and students on the streets of Paris in 1968. If the notion of beach was the promise of a life with greater freedom and responsibility, paving stones were a history which extended from the present back into the past. The house we live in, the place we work has a history. It becomes part of who we are. The back bedroom in my home in Lakewood was used by a friend of our family from Slovakia,who had come to America because his wife left him, then by my older brother,and, once he left home, by me. After I left home, my father slept there. After he died and I was divorced, I would stay there once again when I returned home for the holidays. The history of the room is part of the histories of those who slept there, but it is also, at the same time, distinct from them. If the room is part of our history, we are part of its. "That which changes our way of seeing the streets," Guy Debord writes,"is more important than what changes our ways of seeing painting." 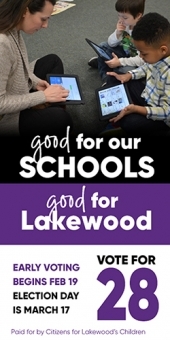 I take it The Lakewood Observer and those who want to see a better Lakewood agree. Volume 2, Issue 5, Posted 10.55 AM / 08th March 2006.